I have been writing book proposals for a LONG time, and while many things in publishing have changed and evolved over the years, one thing that has not is what makes a book proposal inherently sellable. As a writing coach, one of my favorite gigs is reviewing book proposals for writers who are hoping to land an offer from a major publisher, and providing them with feedback on how to make their proposal as irresistible as possible. 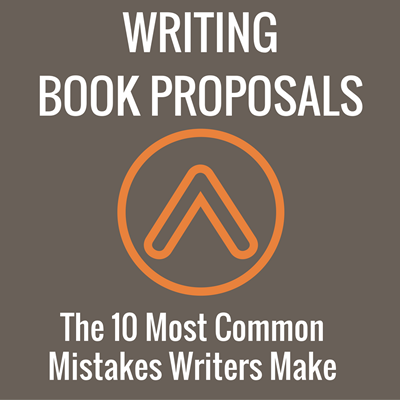 In this post, I share the top 10 most common, and in my opinion biggest, mistakes I see in book proposals. An Overview without a strong hook is like a Philly cheese steak without the cheese. There’s nothing to capture a publisher’s interest and keep them reading. Yet, lack of a strong hook at the head of the Overview is something I find in nearly every book proposal I review. The hook—which could be defined as the essence of an idea presented in a compelling, simple, and clear way—is absolutely critical. It must be unique, instantly getable, and motivate the proposal reader to keep turning the page. I know this one’s not easy—I personally loathe writing Overviews because it can be incredibly challenging to nail this—but keep rewriting and editing and tweaking and revisiting and you’ll eventually get there. There is a lot of information flying around about how large of a platform is large enough. And while I don’t have concrete figures to share with you, I will say that unless you have a large national following, a highly-engaged social media following numbering in the hundreds of thousands, or are frequently interviewed by high-profile print and TV media outlets (or even better, have a show of your own), your platform likely isn’t big enough to wow a publisher. And because these days, platform is a critical piece of selling most books, this can be a very confusing (and distressing) topic for would-be published authors to consider. We can’t all have shows on the Oprah Channel or have given a TED Talk that’s been viewed by millions, and that’s okay. Your platform is still important. What you want to do is talk about your passionate fan base, your unique market reach, and describe the powerful ways in which you engage on social media and through your list (if applicable) without getting into specific numbers. Sure, a publisher or agent can do some digging of their own and learn about the size of your platform, but that’s better than sharing statistics that are less-than-impressive and turning off a publisher before they have a chance to get really excited about your idea. And at the end of the day, an excellent idea can still sell on its own merit. There are markets for the book and then there are markets for the book. Failing to define all the possible different readers for a particular book is a lost opportunity for proving there is a large pool of future book buyers. For example, I’ve written several books for teenagers, but I know the market for my books is much broader than that. In my Markets for the Book section of my last proposal (a book for teen girls), I highlighted different categories of readers such as: guidance counselors, mentors, child therapists, parents, godparents and grandparents, teachers, teenpreneurs, and girl advocacy organizations. The idea is to show that LOTS of people are going to be interested in purchasing the book and then provide details for these different groups of readers. It’s no secret that the Promotional Plan for a proposed book can make or break a sale. Because publishers have very little budget for promoting their titles, they rely heavily on authors to do the heavy lifting and they’re looking to see how committed you are to moving books. There are a number of traditional (read: typical) actions all authors include in a promotional plan, such as creating a website, promoting through social media relationships, creating a book trailer, etc. These are all great and they should definitely be included. But I encourage you to stretch yourself to come up with unique, creative ways to get your audience engaged and buying books, and then include each and every idea in your proposal. The only rule is: if you write it down and say you’ll do it, you need to be willing to actually do it once the book comes out. To get ideas for out-of-the-box book promotions, observe your favorite authors’ launch plans and think about ways to apply some of their strategies to your own book. The About the Author or Author Bio of a proposal is the place to show the publisher or agent that you are uniquely qualified to write the book you’re pitching; that in fact, no one else could write the book you’re looking to sell. You do this by (succinctly) sharing your story, highlighting your related credentials, drawing attention to your most impressive successes, and conveying your utter passion for the content of the book. What you want to avoid doing is using this section of the proposal to “convince” the editor or agent that you will complete the manuscript on time or deliver a solid book. This is assumed—it’s called being a professional. As a result, mentioning this can raise red flags (do you normally not hit your deadlines?) and make the writer come off as inexperienced. While you may believe your book has the potential to be the next Eat, Pray, Love, saying so in your proposal is likely to be a big turn-off to an editor who knows that runaway bestsellers are a rare phenomenon, not to mention highly calculated and planned on the part of the publisher. While I recommend avoiding these types of comparisons with high-profile books, it is acceptable to mention popular books to identify a specific market (i.e: readers who love Elizabeth Gilbert’s Eat, Pray, Love will resonate with the message in your book) or help paint an easily getable picture of your book’s angle (i.e: the book is a cross between Eat, Pray, Love and Marie Kondo’s The Life-Changing Magic of Tidying Up). I totally get it. Writers want to make their proposal stand out and look creative and beautiful and unique in a sea of unread book proposals, but I suggest your use extreme caution before going rogue with Adobe’s InDesign. While some publishers may consider a proposal that breaks the formatting norms, for others, this becomes a reason to toss the proposal aside and move on. At the very least, be sure your proposal is double-spaced, uses a very readable (standard) font, and has reasonable margins on all pages (ideally 1.5 inches all around). If you do want to get creative, save it for the cover design of the proposal, where going off-form is more accepted. I frequently find information in proposals that’s either obvious or was clearly included because the writer read somewhere to include it but doesn’t actually make sense in the context of their book. For example, when describing possible markets for the book, there’s no need to mention that the book can be sold in brick and mortar bookstores and on Amazon. You know, I know, and most importantly, book publishers already know this is true. No need to restate the obvious. Likewise, unless the book you’re pitching has some unique design or formatting considerations, including a Format for the Book section is completely unnecessary. While you want to come across as being researched, thorough, and professional, including elements that don’t provide essential information to the publisher is a waste of your time and theirs. Chapter summaries (also known as the Book Outline) are a crucial part of any book proposal because they are the place where the agent or publisher can see your thinking—how you organize your ideas and how logical your flow of concepts is. They’re also a part of a proposal that many people miss the mark on, either by being too short and vague or too rambly and unfocused. My suggestion: choose an approach for your chapter summaries (such as title + sample paragraph of writing from the chapter itself + 1-3 paragraphs summarizing the rest of the content for that chapter. And one last tip: When describing your chapter, write in the third person and don’t address the read of the proposal (agent or publisher) as “you.” Instead use terms like “the reader.” Why? Because the person reviewing your proposal isn’t necessarily the actual audience for your book. By the time a writer gets around to crafting the sample chapters for a proposal, there’s a good chance they’re seriously running out of steam. After all—they’ve likely spent months thoughtfully crafting a powerful book proposal and they’re almost at the finish line. As a result, sometimes sample chapters get less attention and focus…and it shows. If an agent or publisher makes it all the way to the very back of the proposal where the sample chapters live, they’re there because they’re interested. Otherwise, they would have tossed the proposal onto the “pass” pile twenty pages earlier. At this point, they want to be wowed by your writing. They want to love what you have to say. They want to be moved by the magic of your prose. Do not disappoint! Get beta readers, work with a copyeditor, have a friend proofread, and review, review, review until those babies are flawless. Your future as a published author may depend on it. Ready to write your own book proposal? I’ve just opened the doors to my virtual course WRITE YOUR IRRESISTIBLE BOOK PROPOSAL for the one and only time this year. I’d love to help you across the finish line of writing your own book proposal. Click here to find out more… enrollment is open through Sunday, 25 September at 11:59pm PST.